Phaidon, New York, 2000. 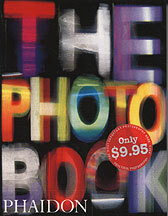 520 pp., 384 duotone and 116 color illustrations, 5x6½". This new, portable edition is a replica of the original (CI114H), smaller in dimensions only. Arranged alphabetically, it features a full-page image and a brief biography on each artist. Glossaries of terms and movements, along with a museum and gallery directory, appear in the back of the book. Perfect for the student!